I’ve been engaged in a little project for several weeks now where I stop and take photographs of the goings on outside Trump Tower on 5th Avenue here in New York. I’ve dropped by several times to take photos for anywhere from 20 minutes to an hour or so. I’ve done it when I’ve come into Manhattan from my wife’s bakery in Queens and it wasn’t out of the way to my next destination. I’ve done it after photographing protests nearby in Times Square. I’ve done it when I knew protests would be taking place right there. And I’ve done it when I’ve just had some time to kill and thought I’d see what was happening among the supporters and protestors who file by Trump’s golden residence on any given day. That’s what I was doing yesterday. Killing some time in Manhattan before joining my wife, my brother and a friend for beers at a Jersey City brewery. Pretty pedestrian stuff in a way. Taking street photos in New York City. But these aren’t pedestrian times. I had been taking photos for 15 or 20 minutes on the block and immediately outside the Tower when one police officer motioned to me to approach the barrier, which splits in sidewalk there into two sides—one side where pedestrians stream by the Tower, the other where people either enter the Tower or hang around outside getting selfies or even posing with the heavily armed, militarized police officers standing on duty there. So I approached the barrier (after dumbly pointing at myself to confirm I was the one he wanted to speak to) and we had a brief discussion I’ll paraphrase here, since I want to be accurate but don’t claim a photographic memory. The officer asked who I worked for and if I was a professional photographer and I responded that I didn’t work for anyone and that I was an amateur photographer. I explained that I was taking photographs outside Trump Tower as part of an ongoing photography project. He asked if I had just texted someone and I said, yes, I just texted my wife about meeting for beers. Why? He said that it appeared I had been photographing the officers, and I said that, yes, I had been photographing the officers because I was interested in all the activity happening outside the Trump Tower and they were part of that activity. He said that my taking photos of the officers—I believe he said when they were changing shifts—and then texting aroused suspicion and that, just as I had an interest in their activities, they had an interest in mine. I thought this a bit odd since people all around me were taking selfies and texting. But I said nothing. I definitely do take photos of the police. And the doormen. And the protestors as they pass by. And the fans in their red MAGA hats taking selfies. And the non-fans stopping to give the finger. And the Asian man yelling at the police and gesticulating wildly last week. And the guy selling garish buttons of Donald Trump as a cartoonish pile of poop. And the wealthy Upper East-siders strolling by in furs and haute couture. And the occasional Muslim women in their hijab. And the occasional Jewish men in their yarmulkes. And kids handing out candy to the police. And the woman asking the police to pose with her dog. Anything that catches my eye. So after agreeing that I had a right to be there and to take photos, the officer and I parted ways. For the moment. I went back to taking photos but already something had changed. I was determined not to leave immediately but to stay until I had already planned to go at 2:30. For beers in New Jersey. But already I knew I was more hesitant. I was deeply conscious of this. I missed a couple of great shots, as I stood there processing what had just happened. The officer wasn’t really at all threatening, by the way, and he was reasonably courteous. But I was already thinking about how that brief interaction might be enough to frighten someone off. So I took another photo or two and then the police officer returned with another officer. Apparently, a more senior officer. He had “NYC Counter Terrorism” in large white letters stitched into his jacket as several of the police in that area do. And he had a pad. He said his colleague had told him I was a freelance photographer and he asked me my name. Now envision that at this point, I was standing with my back to a second set of metal police barriers and they were both standing before me, quite closely. So I was physically hemmed in. Had I wanted to, I couldn’t have gone anywhere. They did indicate that I raised suspicion because I was there for several minutes. Understood. Though I’ve seen Trump fans taking selfies there for upwards of 20 minutes at a time, too. I even tried explaining that when photographers engage in a project it may entail standing around for hours waiting to get the right shot. (This is true: Photography is often a lonely, compulsive hobby, requiring vast reserves of patience: This photographer spent 6 years and some 720,000 shots to get one photo. Some photographers have been accused of faking their photographs, which were really the result of waiting for the decisive moment for hundreds even thousands of hours.) The first officer wasn’t having it. He said such projects would involve a tripod and lighting and I said, “No, that’s not true.” And of course, it’s not, but they interrupted before I could explain further. The second officer extended his hand, I took it and we shook hands. Somewhat oddly, he asked my name again. I think he intended to signal a friendly introduction now. “Robert,” I said. I had made it clear a few times this was an ongoing project and I planned to return to Trump Tower in the coming months. They said that was fine. They’d know who I was when I returned. Now, don’t get me wrong: I understand that if I’m going to engage in a project like this, I’m going to attract attention to myself. (Ironically, however, the best photos usually come when you’re not drawing attention to yourself.) And I understand that these guys are just doing their job. They’re almost certainly good guys. I tried to be polite with them, even when I was countering their questions with my own. But I also can’t deny the ensuing dynamics. I was standing outside Trump’s sometime residence taking photos when he was miles away in the White House (or further away), but now this once typical block of New York City real estate is given more scrutiny than the area we used to refer to as Ground Zero. That’s not an exaggeration, either. If I stood in that area today—as I often have—I doubt the police would give me little more than a glance. I get the difference: Unlike every President before him, Trump has insisted on maintaining two residences—three if you count Mar-A-Lago. And that great golden shaft on 5th may have become a target for terrorism. Theoretically, Melania Trump and Barron may be upstairs. I’ve seen Kellyanne Conway there. I get it. And yet. There’s what we can only refer to as a “chilling effect.” As a photographer, I immediately became more hesitant. I took fewer photos. I missed a few good shots. I stood staring at my phone while actually thinking about next steps. Processing what had just happened. What was unspooling in my head thought-wise. Trying to be aware of what I was feeling and not just react to it. I don’t have pro photographer chops, of course, and I wouldn’t expect a professional photojournalist to scurry off after that encounter. Neither did I want to. But the immediate psychological effect was undeniable. Now, I don’t know those cops. I’m not accusing them of unprofessional behavior. But I am highlighting the dynamic. And I’m trying to ensure I’m aware of it even as I hope to continue my little project in the months to come. Some things you should know: You do have right to take a photo on the streets of New York. NYC streets are considered public spaces. Trump Tower is also explicitly labeled as a public space. The ACLU provides clear guidelines for anyone taking photos in public spaces in the United States. Police officers, for example, may not demand to view your photographs or confiscate them. They may not search your cell phone. They may prevent you from interfering with law enforcement operations. This latter point seems open to interpretation, potentially. 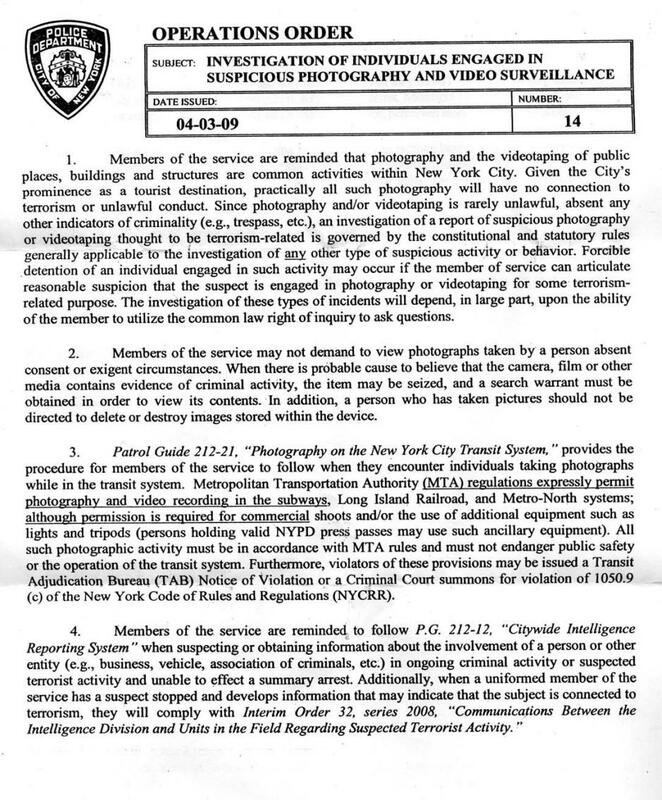 Some photographers even advise printing out and carrying the New York City laws and NYPD operational orders such as this to present to police officers if necessary. The police are not all equally knowledgeable on the subject. There are many websites and articles dedicated to this subject, too. This excellent pamphlet is updated regularly, so photographers can be aware of their specific rights. Some efforts have been made since I moved to New York over ten years ago to restrict photography which incorporated tripods, the argument being these were more likely to be professional productions needing a permit. That’s not true, of course. Many amateur photographers carry tripods for low-light photography, for long exposures and to conjure various light and movement effects. And the city eventually reversed its ruling on tripods and the NYC.gov site explicitly allows them. Photography is also allowed on the subway, by the way. Though I have noted a difference here: Since photography on the subway seems much more intimate due to the close quarters, people are not as likely to shrug off being photographed. That seems fair. I once took a photo, for example, of a woman at a “Black Lives Matter” protest in Union Square in a crowd with her sign. She was one of dozens of people in the photo. I happened to see her on the train later and raised my camera to take another photo of her with her sign at closer range and she immediately protested. “Sorry,” I said, “May I take you photo?” “No,” she said, “You didn’t ask.” She was visibly angry. Technically, I could’ve taken her photo anyway. But I understood her point. The situation did feel different. And it prompted me to think more deeply about how I take photos. I plan on continuing my photo project. It may amount to nothing. I do think I’ve taken some damn good photos. I think they portray some noteworthy events and dynamics occurring and still developing here in New York City. I hope to publish the best of these images in a set somewhere eventually, which may deserve wider exposure. I recognize my project may seen an odd, even compulsive hobby to some. For me, it’s a fascinating opportunity to examine a very specific and unusual course of events unfolding in my city. I may alter my behavior outside Trump Tower, but I hope it won’t be in ways which limit what I hope to accomplish there. Maybe I’ll make an effort to interact more with the police there. Politely but with enough distance to maintain the integrity of my little project. But I don’t want to stop.